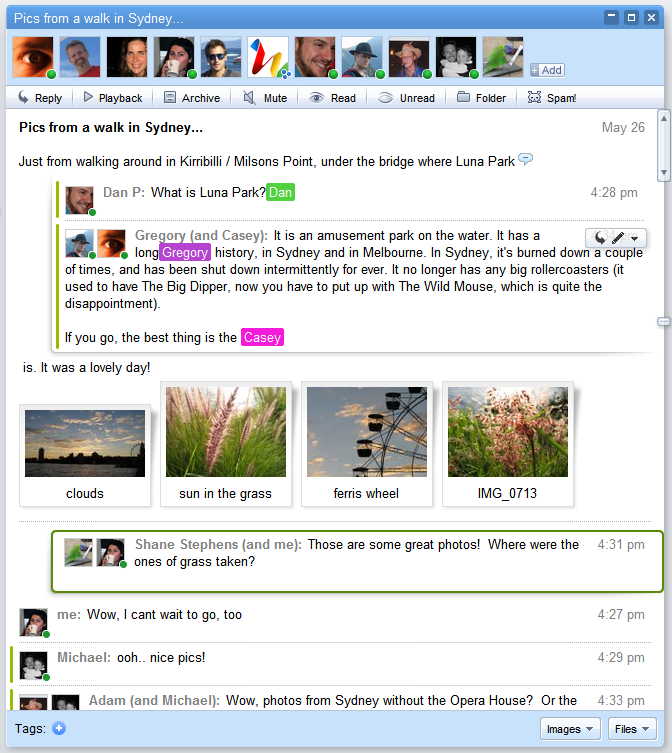 Is Google Wave the Solution to Social Network Over-Sharing? When Google unveiled Wave this morning at the Google IO conference, they described it as a marriage of e-mail and instant messaging. But to me it looks more like the kind of social network that I'd really like, one where I can exactly target the people with whom I want to share a comment, a photo, or a video. One of the problems with Facebook is that most of the things you share through it go to everybody you have friended, whether those people are relatives, tennis buddies, coworkers, or your boss. But few people want to share everything with everyone they know. The stereotypical example, of course, is posting pictures of weekend debauchery and having your boss see them. But it's not just a matter of being unintentionally embarrassed. Sometimes you come across a video you know your friends will love, but your mom and dad just won't get the joke. Or you want to share a work-related link with professional colleagues, but know that your friends will be utterly bored with it. Google Wave is still only a glimmer in Google engineers' eyes; the company just made source code available to select developers today. (The service is based on HTML5, an open standard that Google made much of on the first day of Google IO.) But from the description and early screenshots of the service, it looks like something that could be perfect for sharing content with only the people you choose. The service's basic element is called a Wave, which can be a simple text message, a collection of photos, a video or other content. Just as in e-mail, you can choose exactly which of your contacts you want to share the Wave with. 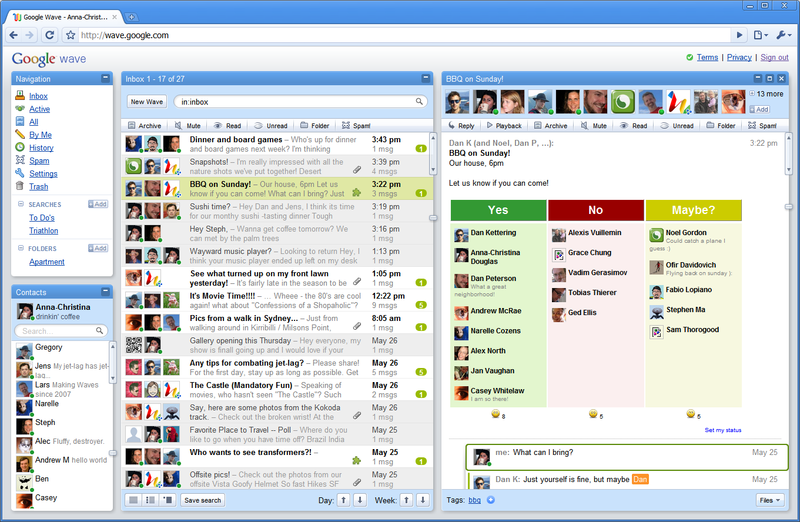 Those contacts can make comments or ask questions that are seen by the whole group. You can see the new comments in real time or, if you haven't been paying attention for a while, you can hit rewind and see chronologically how the Wave developed. It seems to me that each Wave is like a new Facebook page created on the fly to share a specific piece of content with a select group of friends. And that's the kind of social network that I'd really like to use. There are other aspects of Wave that seem to directly mimic services like Facebook. One of the reasons Google made their presentation to developers this morning, for instance, is that they want those coders to produce extensions that can live in Wave. The extensions are essentially like Facebook apps, except useful. They showed a few examples. One would make it easy to send a tweet from Wave. Another puts on Evite-style party planner in Wave. 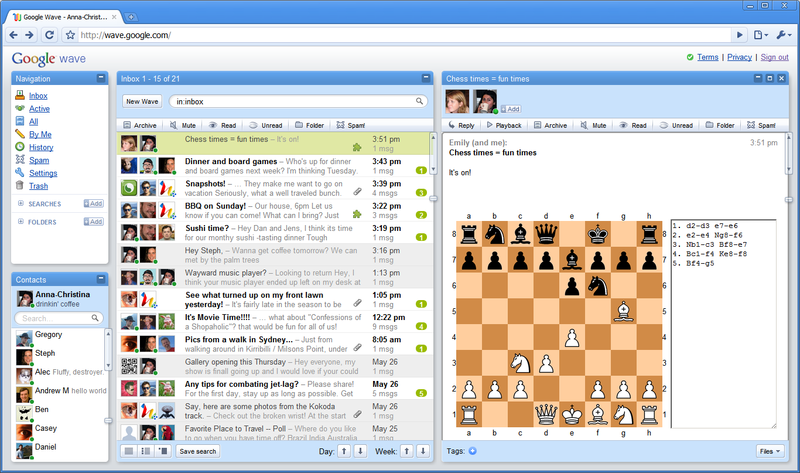 Still another would let you play virtual chess with a friend. Don't get me wrong: I can see how Wave would be useful in professional circumstances, collaborating on a group project, for instance. But to my mind, it looks most like the next evolution of social networks. And that's an area that desperately needs to evolve.